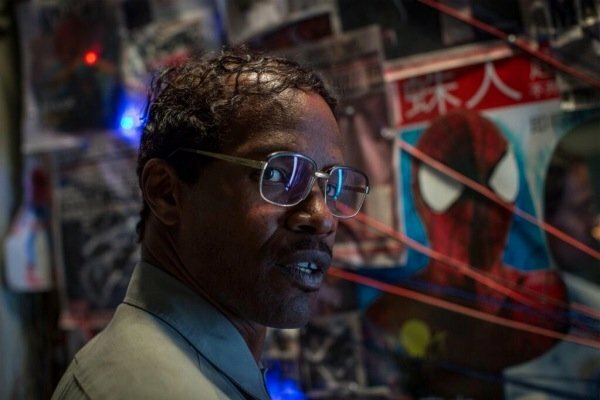 Up until this point, the best image we had of Jamie Foxx in costume as Electro from Marc Webb’s The Amazing Spider-Man 2 were from on-set spy photos snapped during on-location production shoots in Manhattan … specifically Times Square. But this Comic-Con-specific EW cover shot (above) gives us the first official look at Electro, facing off against Andrew Garfield’s wallcrawler in a tease for what’s sure to come in San Diego next week. Previous shots had Foxx under a hood, suggesting the glowing blue of his face in the post-Electro conversion. Those who have been tracking the progression of the character have also seen photos of Foxx in a geeky comb-over playing Max Dillon, the Oscorp engineer who, through an expected accident, receives the power to harness electricity and become Electro. Here’s a shot of Foxx in character as Dillon. What this cover suggests, though, is that Electro actually is the main villain of Webb’s Amazing Spider-Man 2, even though we’ve seen Paul Giamatti filming scenes as The Rhino, and we know that Chris Cooper has been cast as Norman Osborn … aka The Green Goblin. I still believe that the Rhino scenes we’ve seen Giamatti filming will be the opening to Webb’s movie, giving Spidey the chance to fight a classic villain who “born” as the result of Oscorp animal testing (like The Lizard), but is not really part of the larger picture until we move this franchise on to The Sinister Six. 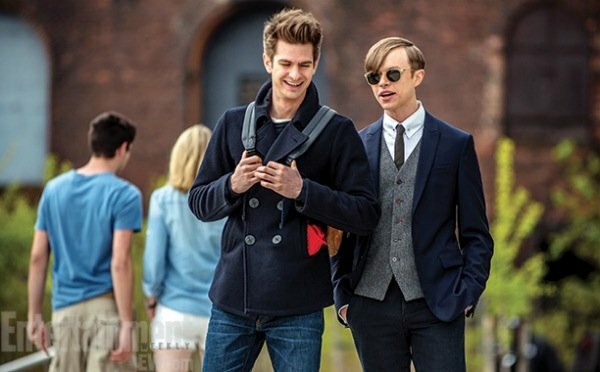 Spidey will lock Rhino away in Ravenscroft – perhaps in a cell next to Curt Connors (Rhys Ifans) – and then can move on to the main story in ASM 2, which will involve Max Dillon (Foxx) and his alter ego. This cover drops in preparation for Comic-Con, which gets underway next week. As a result, EW also has covers created for the Carrie reboot, the TV show Orphan Black, and Ender’s Game. We’ll have plenty more from the annual convention about Webb’s anticipated Spider-Man sequel, but for now, what are your thoughts on Foxx’s glowing new look for Electro?